The data points are in 4 dimensions. We can get an idea of the data by plotting vs for all 6 combinations of j,k. 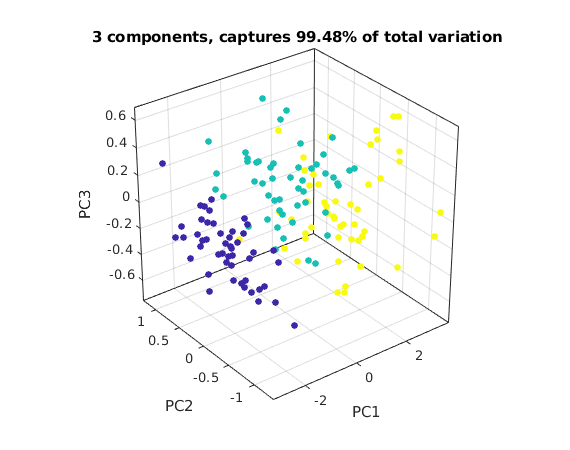 Note that species 0 (blue dots) is clearly separated in all these plots, but species 1 (green dots) and species 2 (yellow dots) are harder to separate. For future measurements of flowers we want to find a way to determine the species from the measurements. 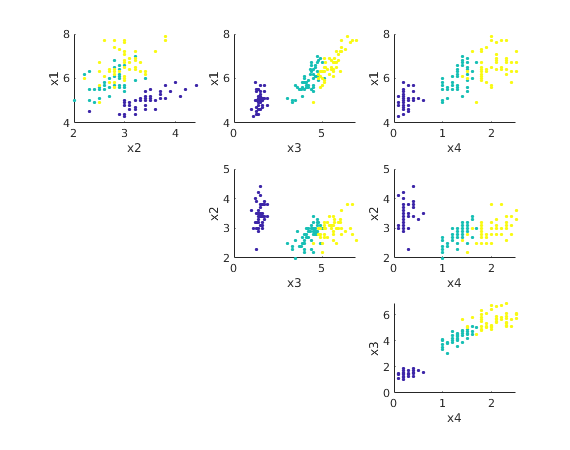 Obviously each of these six 2D plots shows only a small part of the information. Can we make a 2D plot which captures most of the information? We first find the mean vector Xm and the "variation of the data" (corresponds to the variance) We subtract the mean from the data values. We then apply the SVD. The singular values are 25, 6.0, 3.4, 1.9. The total variation is . We find the coefficients of the data vectors with respect to the singular vectors . We then plot the first 2 coefficients of each data point. 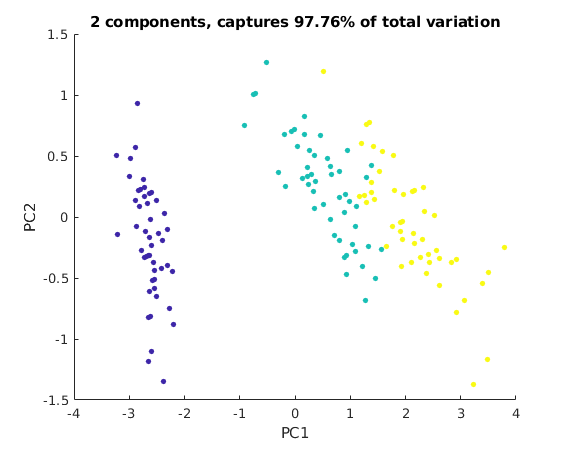 This 2D view captures almost 98% of the variation of the original data points. We can now better see how to separate species 1 (green dots) from species 2 (yellow dots). We can now try to draw some boundaries between the yellow, green, and blue regions. 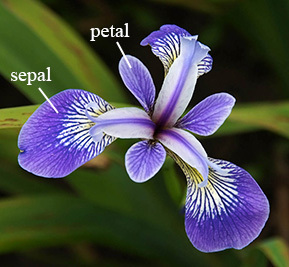 This allows us to classify flowers from measurements. We now plot the first three coefficients of each data point in 3D. The image below only shows one view. Run this m-file in Matlab, then you can spin the graph around with the mouse to see the points in 3D.